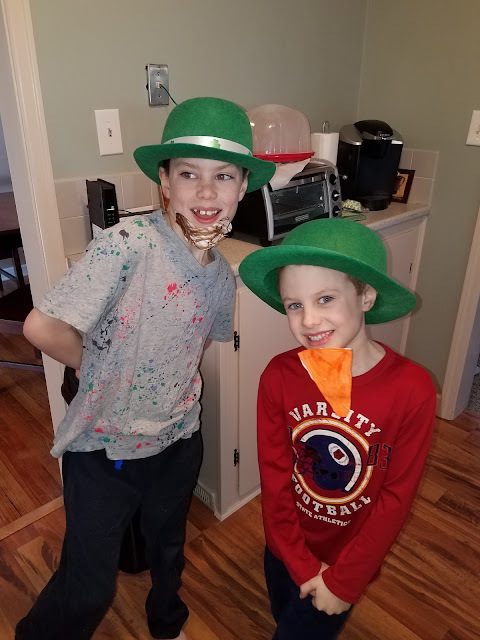 St. Patrick's Day didn't include any green beer (for me), but it did include a return visit from the kid's favorite leprechaun's Sammy and his mischievous brother Michael (to fully understand what I'm talking about, read about last year's St. Patrick's Day here). 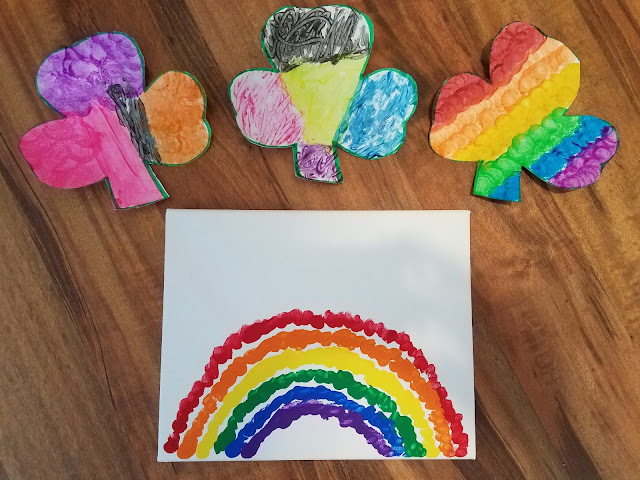 The few days before St. Patty's Day the kids did art work and a few activities, but most of our celebrating happened on Friday (the actual celebration day). 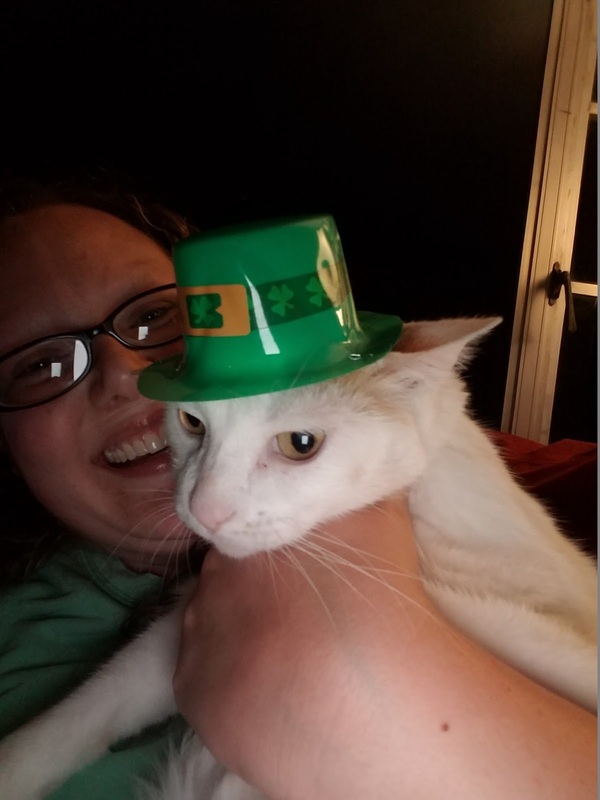 The cat helped me get ready the night before.....he was thrilled. The kids LOVE games! We played Find The Leprechaun Hats first thing. 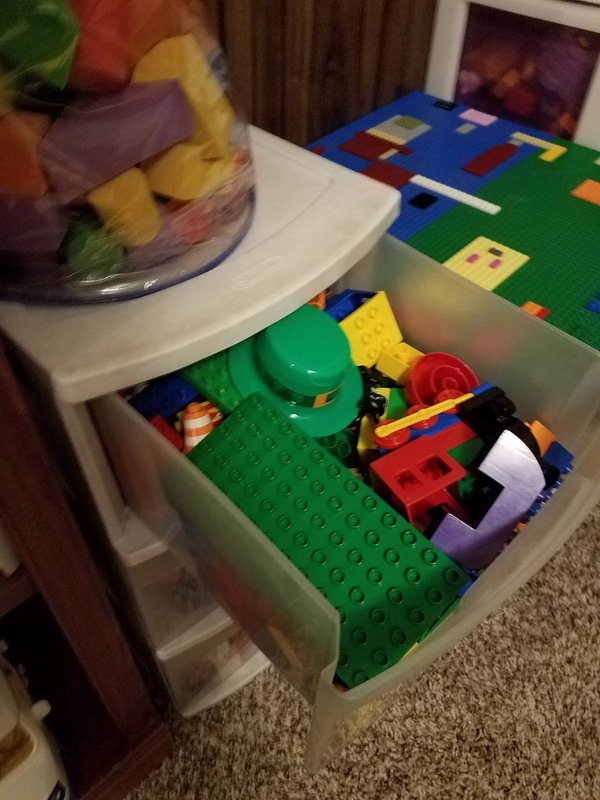 Some of the hiding places included under the dino puppet, in the rocks, in the Duplo bin, in cubbies, hanging on odd things, etc. 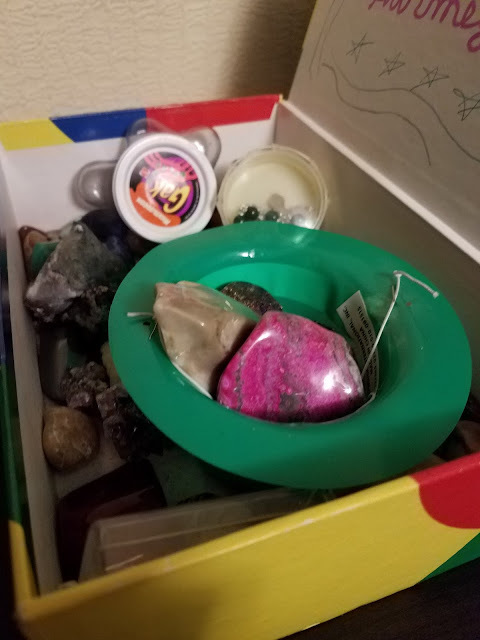 After the kids found all 9 of these mini hats, they took turns hiding them for each other. 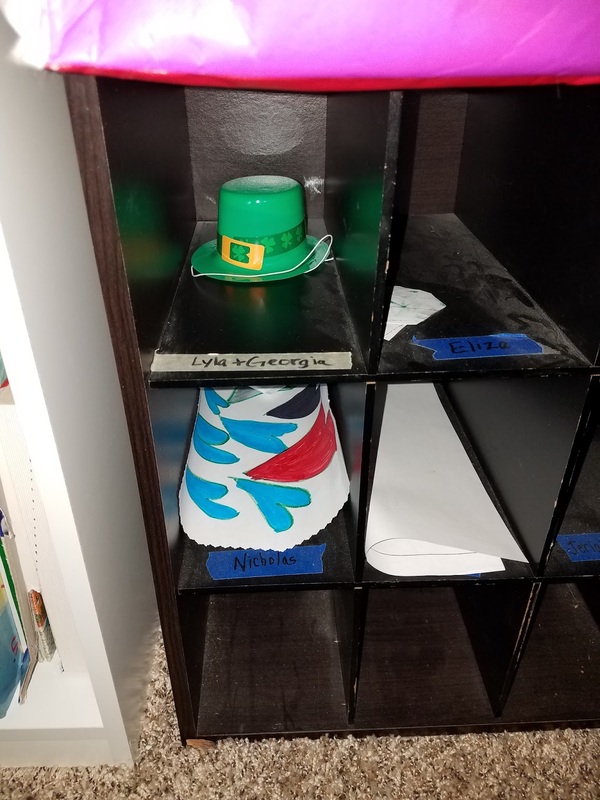 There were some very creative hiding spots and only three hats turned up missing (because they forgot where they hid them). The kids have been waiting for Sammy and Michael to make their return all week! 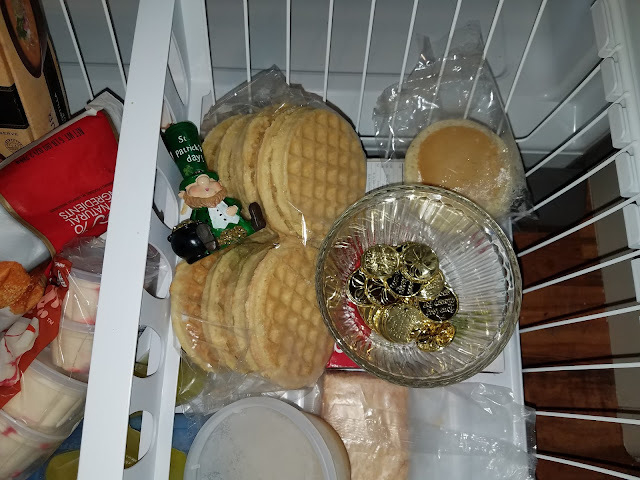 Those naughty leprechauns hid their gold in our freezer (and then continued to hide it in random places all day long) and got into our paint! 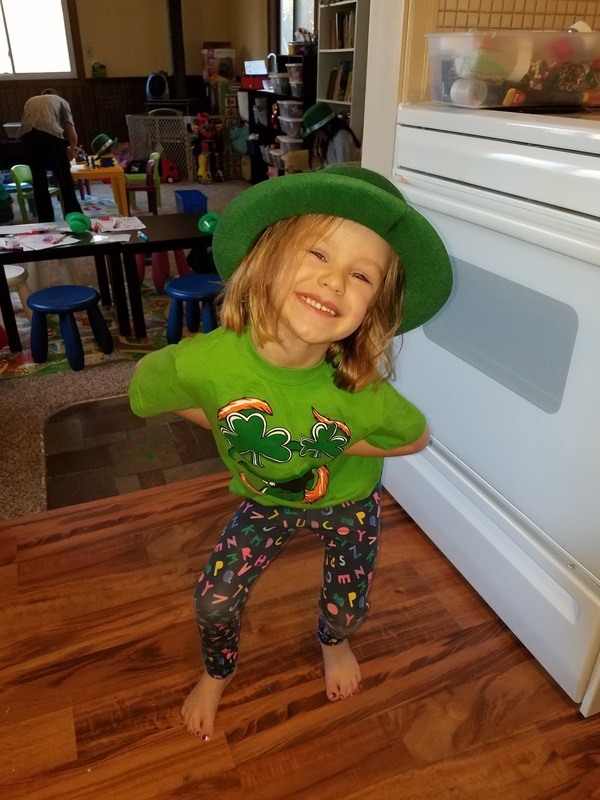 We read about Irish folklore that says if you catch a leprechaun, you get three wishes if you set him free. 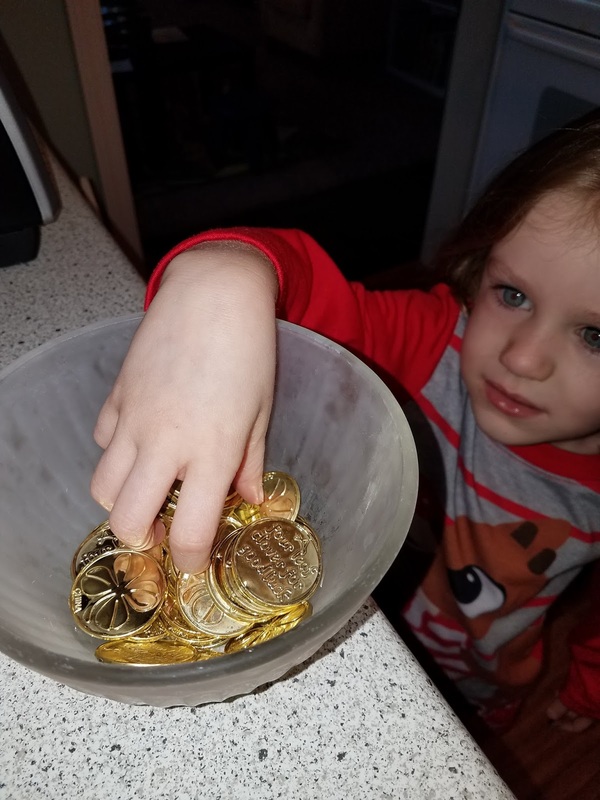 The kids tried all day long to catch our leprechaun's in action so they could get three wishes. 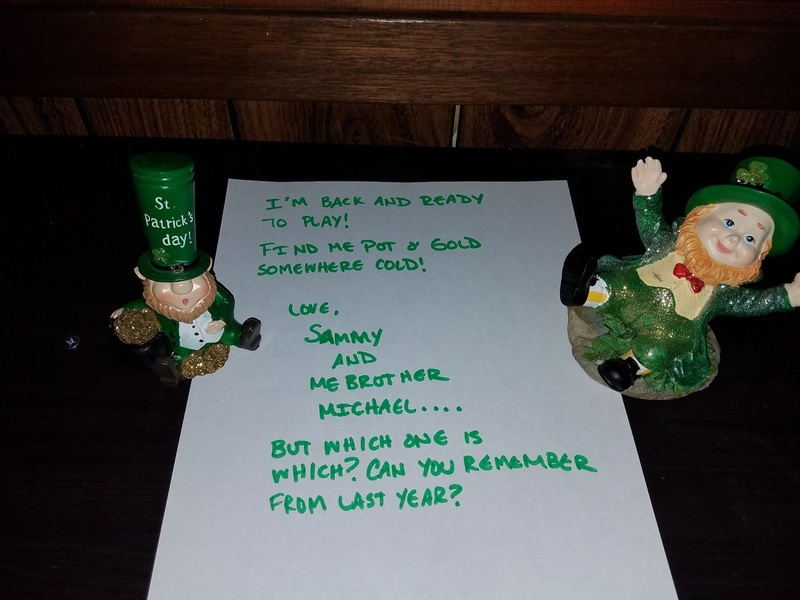 Alas, they never caught them and now our magical leprechauns are back in Ireland recharging their magic for next year. 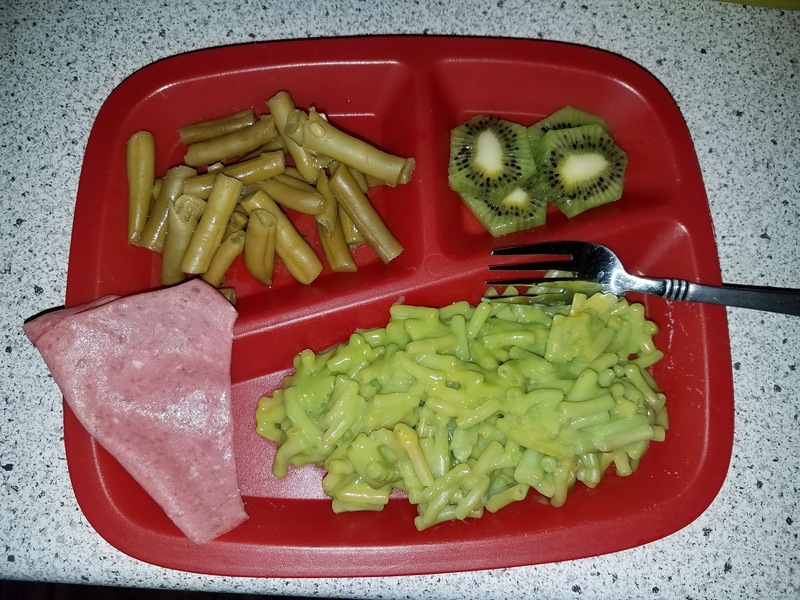 I really don't know how much the kids believe in all of this, but they sure do love it and go along with it! 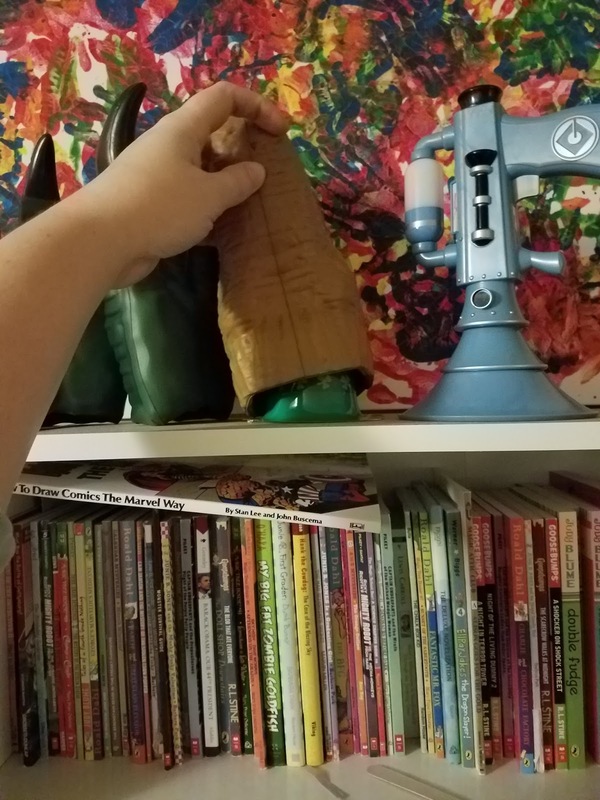 The look of shock on their faces whenever the leprechauns move or do something naughty "right in front of us!" 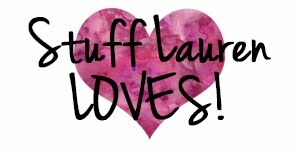 is priceless. 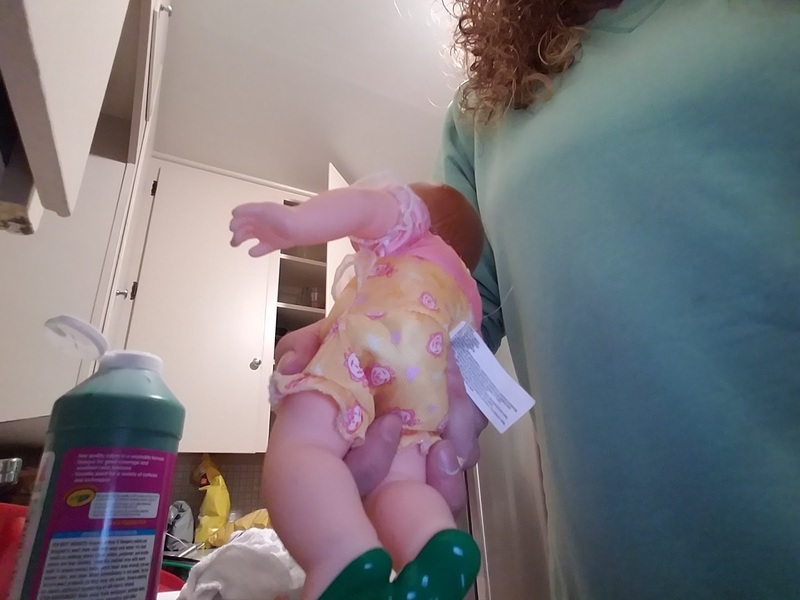 The doll helped me out with little leprechaun feet prints all around the daycare room. 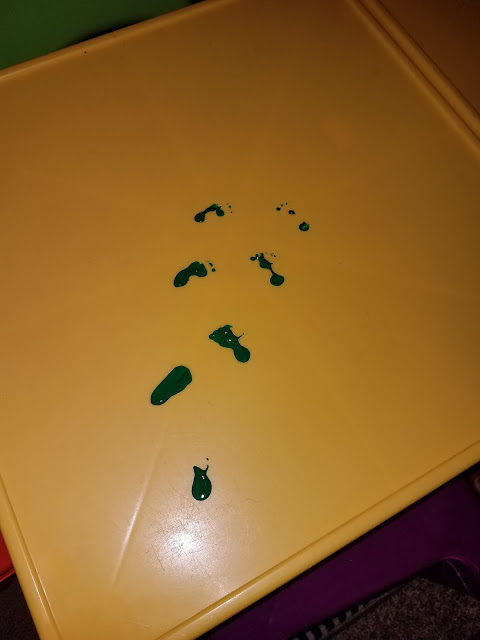 Thank goodness for washable green paint! 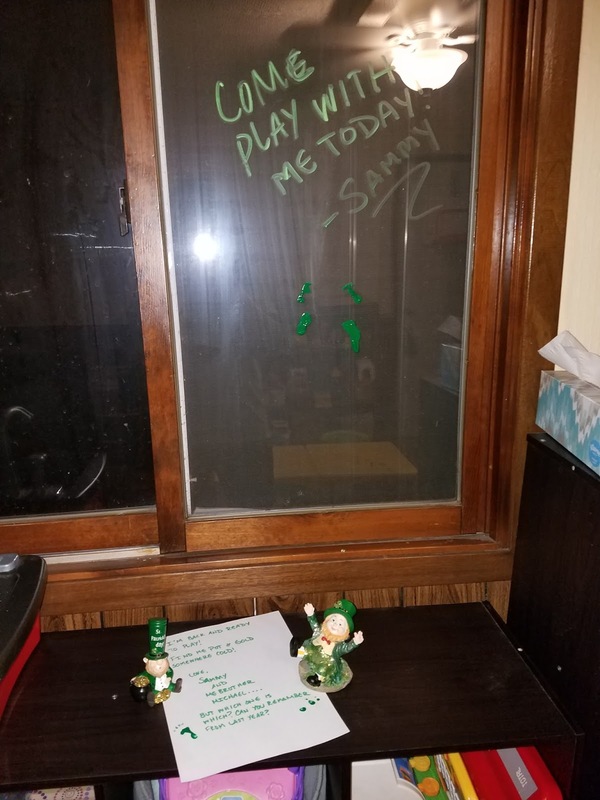 He even wrote on the window (with Crayola window markers)! 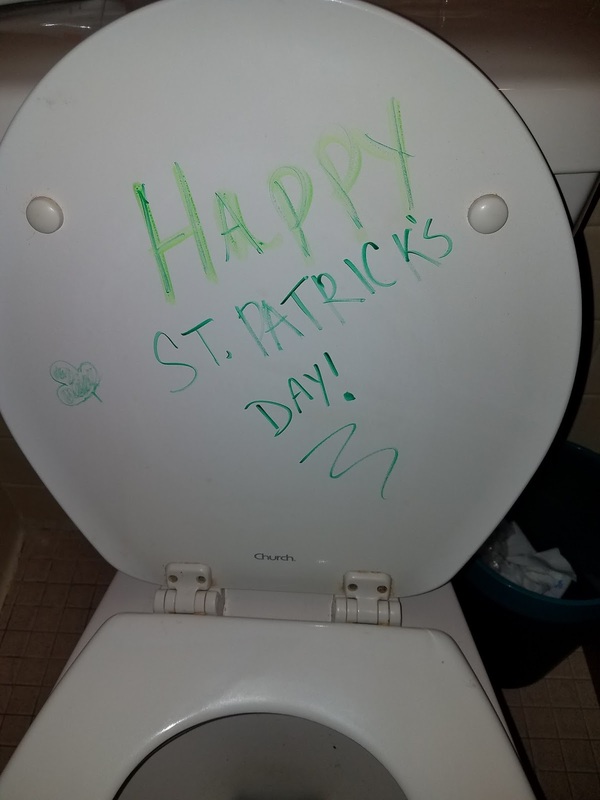 He even visited the bathroom! The kids did not like finding the pot of gold in the freezer because it was "too cold for our hands!" 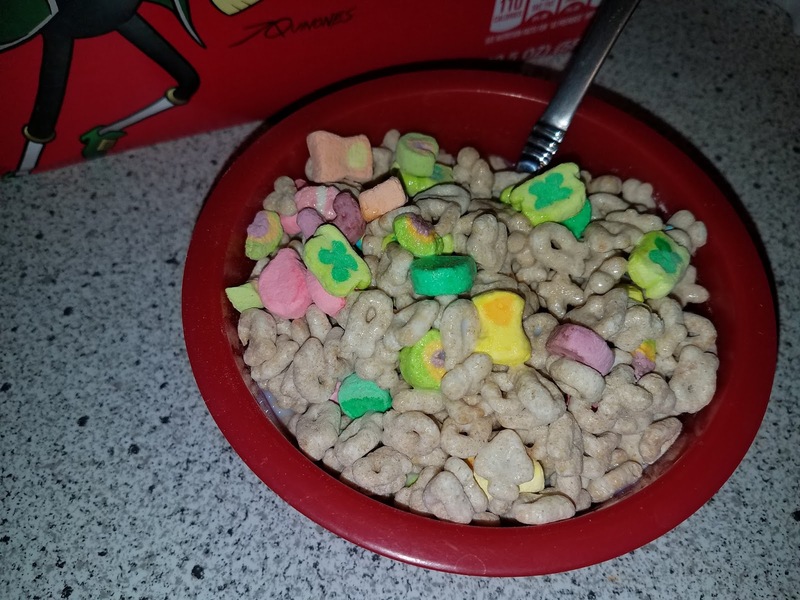 Lucky Charms for breakfast, because what else would we have St. Patty's morning???!!? 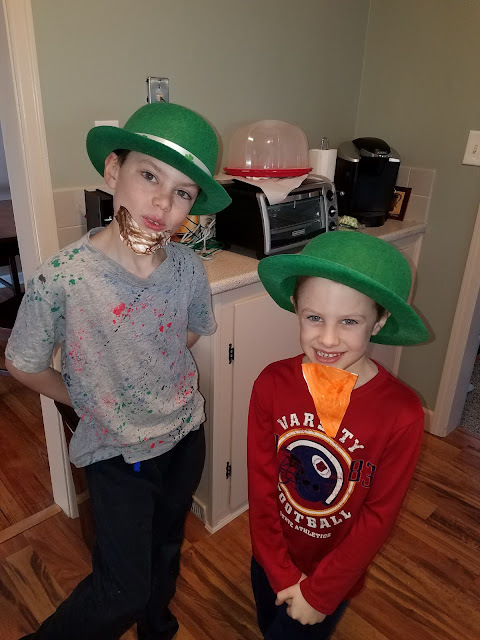 The kids couldn't just wear the Leprechaun hats, they had to make themselves look like leprechauns too! 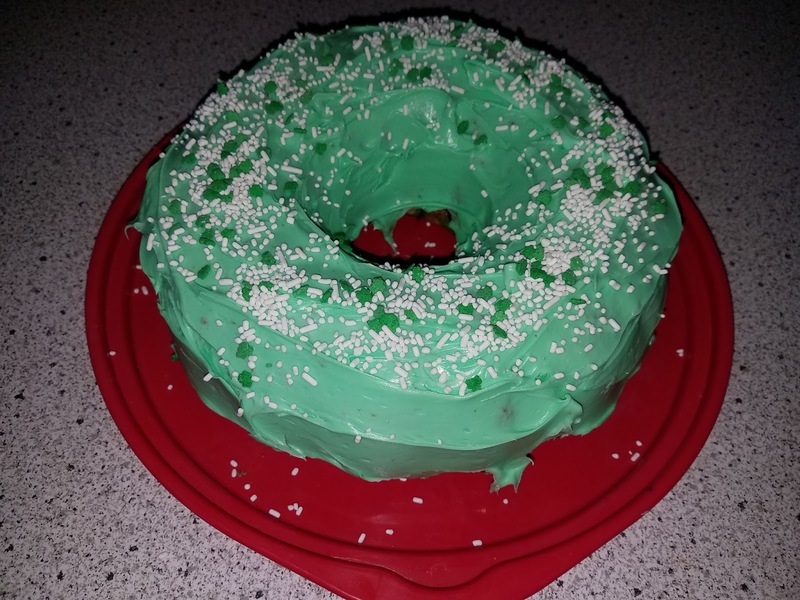 Our St. Patty's Day cake with a green middle. The kids decided we must sing Happy Birthday to Sammy and Michael because it only makes sense that their birthday's are on St. Pat's Day too! 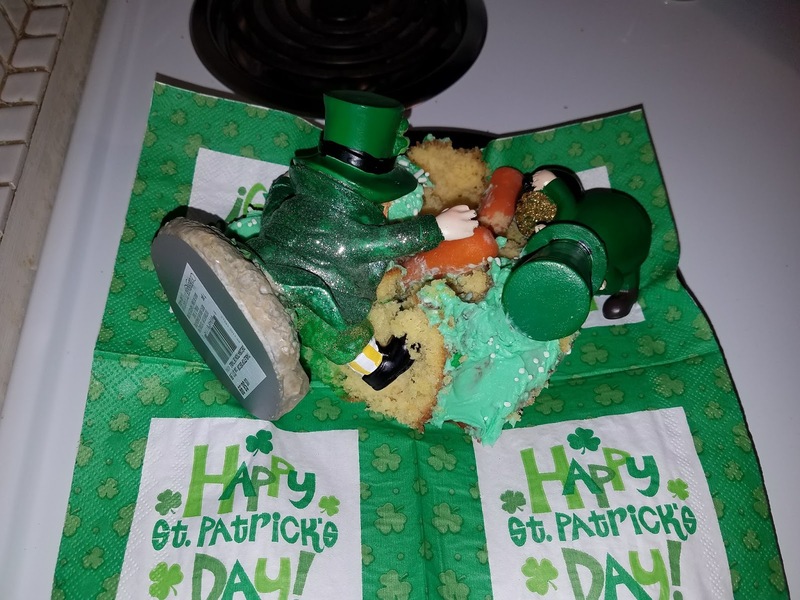 And wouldn't you know it, those naughty leprechauns dove into their piece of cake and played with it with the leftover carrots from lunch! 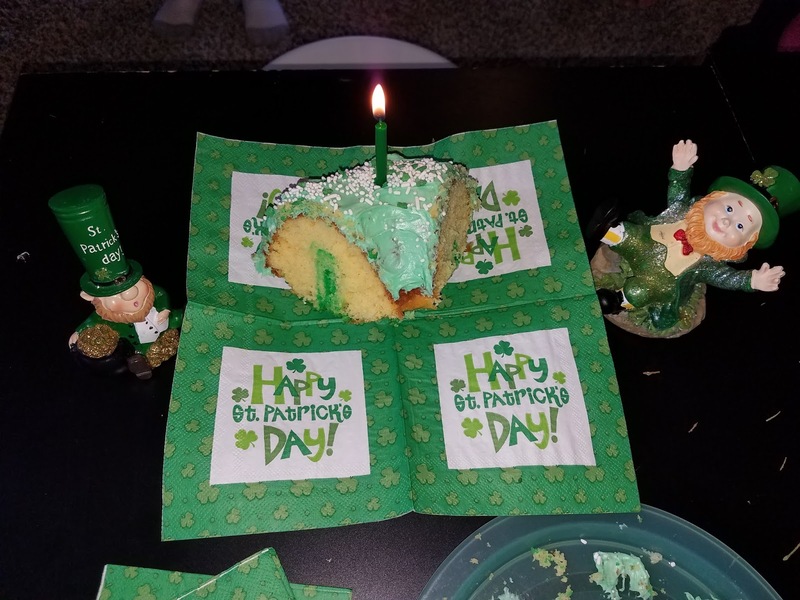 All when no one was watching because they were emptying their plates....those sneaky leprechauns (wink, wink). We also broke out the rainbow rice sensory bin for our sensory play, but I failed to take pictures of it because the kids spent more time writing the "magical" leprechauns letters and waiting for them to come to life so they could capture them! As if our day wasn't busy enough, the kids wrote out a plan for NEXT St. Patrick's Day so we can make it even more magical!